A ride height gauge is one of the most important tools an on-road racer can own. Dynamite has taken this tool one step further and made it even more useful. In addition to the “normal” stepped gauge (segmented in 1/2mm increments from .5-10mm), the opposite side of the tool is marked off in 1/10mm increments. 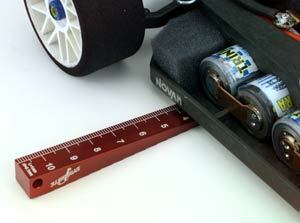 Now you can know your ride height is exactly 4.7mm instead of assuming it’s a full 5mm. The gauge works as a conventional ruler too. Machined from solid aluminum and anodized in Dynamite red and laser-etched, this will be the last ride height gauge you’ll ever need.